Smart City gives smart challenges for smart people. Our goal is to give for our customers new inspiring tools for decreasing human CO2 footprint in the world. Our street lightning management system, integrated with LED luminaires gives a new possibility to save energy via dimming and get extra economic savings from service and maintenance system. Gridens engineers have developed client friendly software during a constant invention process. 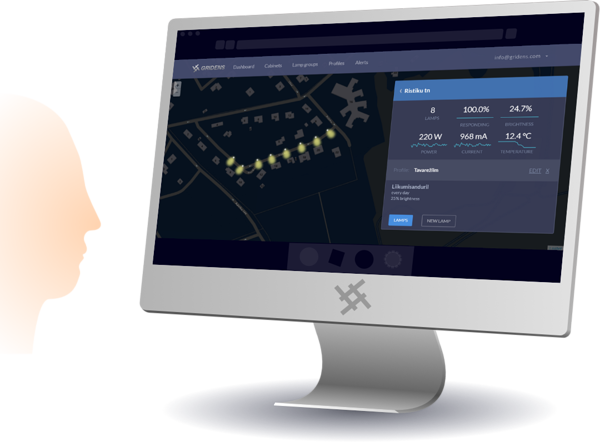 Our software (developed 100% in-house by Gridens) is enabling capability of high speed continuous information flow between front-end user, cabinet controllers and every single luminaire controller in any system. Besides the user friendly web browser you can also use application in your mobile phone everywhere as a proprietary software user. 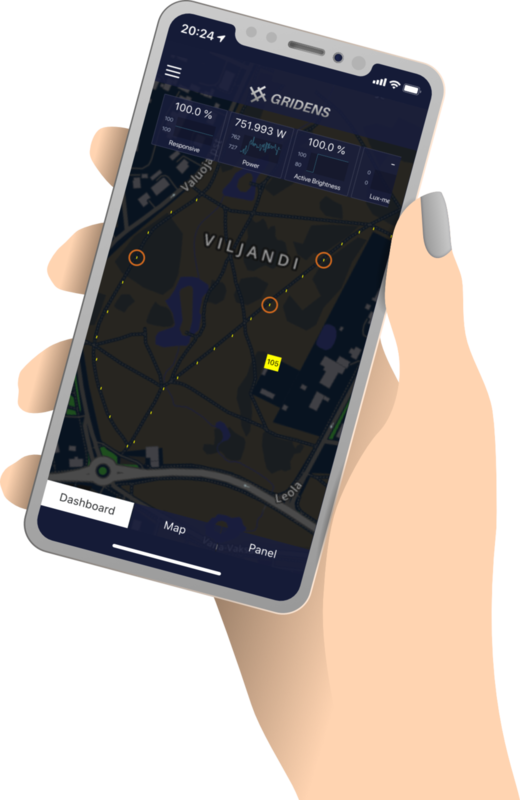 You can get total overview of street lighting energy grid, system controlling hardware and controlled hardware with vital information on a geographical map. You can watch and analyze all necessary parameters within the system as power consumption, supply voltage, temperature of the luminaire, dimming level and controllers radio communication quality. You can create system dimming profiles on the cabinet controller level according actual life necessities as street traffic rush hours, security etc. for required normatives system by your defined group or even for a single luminaire. Switching system on and off is possible by using astronomical time unit and by twilight indicator. Anyhow, you can make your system even more sophisticated and use different kinds of movement sensors for luminaire dimming. You can even create illuminated bubble witch moves together with pedestrian, cyclist or a car on the street. You may have different and unforeseen necessities to switch on the system on the full illumination. In that case you can manually override all the profiles and go to full output of the system in defined occasion. You will got immediate notifications to your phone or e-mail about lighting system errors and other defined malfunctions. You can create complete overview of the controller error responses, system malfunctions and maintenance works, hardware warranty and other parameters for every controller in your system. It opens new more resource efficient opportunities for system administration and maintenance. Your system will work according to last entered profile even when communication with the system (server) stops for any reason. Data transfer is secured and encrypted according to at least AES128 security standard. Central control unit has been projected and constructed in close cooperation of system users, programmers and engineers. Thanks to all considerations we have joined into to one housing all necessary functions such as controlling module, communication module with data buffering capacity and Li-Ion battery for back-up power supply. Luminaire controller has been projected and constructed in outstanding cooperation with luminaire producers, programmers and engineers. Controller is installable directly inside of the luminaire casing or separately into weatherproof housing. Luminaire controller is capable to switch in separate lights on the same mast of the controlled luminaire or if necessary two luminaries on the same mast. It measures all needed parameters and has input for different sensors as for example motion sensor. Gridens has developed adjustable luminaire controllers according Zhaga and NEMA standards. Zhaga is global lighting-industry organization that aims to standardize components of LED luminaires. Association NEMA is oriented on the same goal. Copyright 2019 © EL Innovatsiooniklubi. All rights reserved.